Page revised in February 2017. The locations covered in this section were visited in May 2008. Narrative of a mission to Bokhara, in the years 1843-1845, to ascertain the fate of Colonel Stoddart and Captain Conolly, is a book written in 1845 by Rev. Joseph Wolff (1795 - 1862). This book made widely known the existence of Bukhara to the British public. The two officers had been executed by Nasrullah Khan, Emir of Bukhara in 1842 on charges of spying for the British Empire. The fame of Bukhara being ruled by a bloodthirsty emir was reinforced a few years later by the execution of the Italian clockmaker Giovanni Orlandi. This poor fellow was abducted in 1851 by a band of Turkmen slave traders in Orenburg, an important military Russian outpost on the frontier with Central Asia. He was brought to Bukhara where he offered to make a clock to be placed at the gateway of the Emir's palace (the Ark fortress). In addition to the clock he also made a telescope for Nasrullah Khan; unfortunately, the emir dropped the telescope from a minaret and he sentenced Orlandi to death. 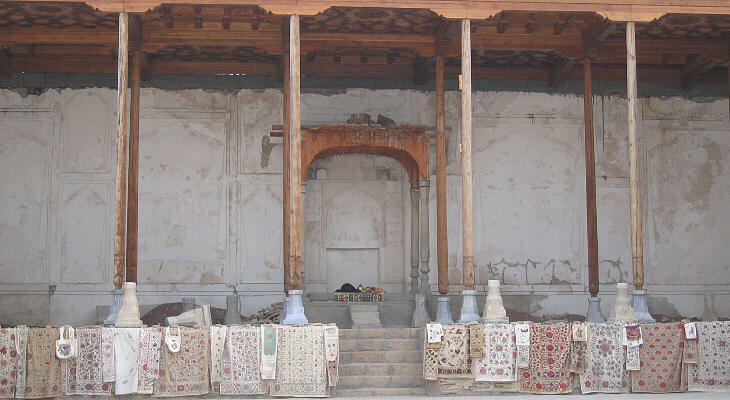 Today Bukhara is more likely associated with a type of handwoven carpet. Bukhara retains only a short section of its walls; they were similar to those which still surround Khiva and were characterized by massive towers projecting from the main curtain in a wave-like manner. In antiquity Bukhara had close cultural ties with Persia. In 673 an Arab raid was repelled, but in 709 the city was taken and Islam was imposed on its inhabitants. Bukhara became part of the Arab Caliphate of Baghdad: later on the administration of Bukhara was entrusted by the Caliph to the Samanids, a Persian dynasty, who revived their country's culture and spread it into Central Asia. In 999 the Kara-Khanids, Turkic-speaking tribes, occupied Bukhara; they converted to Islam and maintained the cultural bonds the city had with Persia. 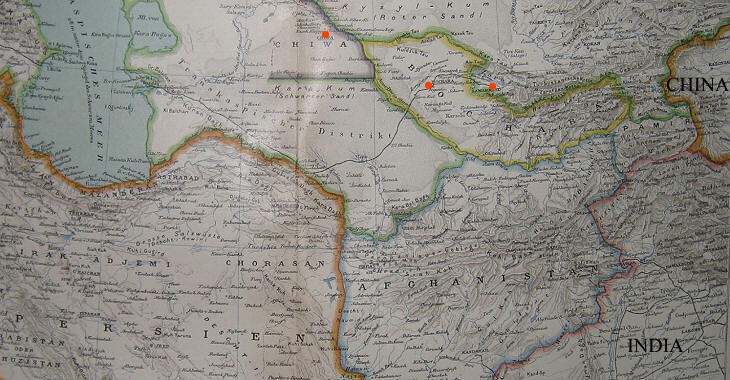 Kara-Khitais and Khwarezmshas, other Turkic dynasties took over from the Karakhanids in controlling Bukhara. Several monuments including Kalon, a gigantic minaret (see page two) belong to that period. The development of Bukhara was interrupted in 1220 when the city was conquered and sacked by the Mongols. They then set fire to it and the inhabitants were carried away as slaves. For three centuries Bukhara remained a pale image of the flourishing city it had been. In 1506 the Uzbeks defeated Babur, the last heir of Timur and established their power over the region; they preferred to rule it from Bukhara, rather than from Samarkand. The XVIth century was a golden period for the city. The Shaybanid (Uzbek) dynasty did for it what Timur had done for Samarkand. At the end of that century the Astrakhanids inherited from the Shaybanids the Khanate of Bukhara; they came from Astrakhan, a town on the Volga River, which in 1552 was conquered by the Russians. The first diplomatic contacts between Moscow and Bukhara date to 1619; the Russians gradually gained control of Siberia and in 1645 they reached the Pacific Ocean. In 1717 the Russians started their first military expedition in Central Asia (against the Khanate of Khiva) and in 1734 they founded Orenburg on the Ural River to support their expansion. While the Russians moved towards Central Asia from the north, from the south a strengthened Persian Empire gained great influence on the area. Between 1741 and 1747 the Khanate of Bukhara became a puppet state in the hands of Nader Shah of Persia. In 1785 the Manghits, an Uzbek family whose members often served as high-level officers/advisors in the government of the country, dethroned the khan and founded the Emirate of Bukhara. While the Khanate had a Mongol origin Emirate was usually linked to the Muslim world (emir was one of the titles of Prophet Muhammad). This dynasty emphasized the religious aspects of life in order to strengthen national identity; the Emirate was threatened by the Persians who were Shiites and by the Russians who were Christians, while the population of the Emirate was mainly Sunni. During the XIXth century the Emirate became a pawn in the Great Game, the strategic conflict between British and Russians for supremacy in Central Asia. Emir Nasrullah Khan (1826-60) managed to play the great powers one against the other. In 1868 however the Russians attacked the Emirate and conquered Samarkand. The Emir had to accept the protection of the Russians and to allow them to build a railway which from the Caspian Sea reached Samarkand and which crossed his country. The Emirate survived until 1920 when the Soviet Army conquered Bukhara and raised the red flag on the Ark. The origin of the Ark, the fortress where the khans/emirs had their residence, dates back to the very early days of Bukhara, but it was almost entirely rebuilt in the XVIth century and afterwards. In 1920 during the fight with the Soviets it was extensively damaged by a fire and only a minor part can be visited; this includes the court mosque and the open air throne hall. This mosque was built in 1712 for the mother of Abdul Fayud Khan, so its official name was Bibi Khanoum (Old Queen) Mosque, the same as Timur's large mosque in Samarkand. It is usually named after a small pool which separates it from the Ark. The elegant eastern porch was reconstructed in 1914-17. The small minaret near the porch is a rather modern addition (1917). Until a few years ago the mosque lay in disrepair and its minaret was tilting precariously. Now (2008) it is in excellent condition. This mausoleum was built in the Xth century for Ismail Samani, the founder of the Samanid power in Bukhara; the design is simple and yet innovative in some details (such as the columns which join the façades). Its elaborate brickwork makes up for the lack of the lavish decoration of Bukhara's later monuments. Ayoub is the Arab name of Prophet Job. According to tradition he struck his staff on the ground creating a well, the water of which had healing powers. A similar event is thought to have occurred at Ashkelon/Al Majdal (Israel). A series of chapels were built around the well in the XIVth century. They were preceded by a monumental façade which is entirely lost. Magok-I-Attari is thought to be one of the most ancient mosques in Central Asia. Its entrance is some feet below the current ground level and this explains why the mosque is called magok (excavated). Attari refers to a herb (attar) market which took place in the vicinity. Today it houses a carpet museum. The mosque was rebuilt/restored several times but it mainly retains its XIIth century features (reliefs, elaborate brickworks and the use of blue ceramics). There are two Bukharas because during the Soviet period a new town was built to the side of the existing one. This meant that, unlike Samarkand, most of the old town was not affected by modernization and it still retains some of its bazaars. The two bazaars shown in this page were built in the XVIth century. Tok means arch and by extension also the vaulted structures which supported the domes. The image used as background for this page shows a detail of the brickwork at Kalon minaret.